It was a brutal morning for special counsel Robert Mueller’s prosecutors as federal judge T. S. Ellis repeatedly questioned the broad scope of the probe of possible collusion between the Trump campaign and the Russians during the 2016 presidential election. An hour-long hearing on the defense ’s motion to dismiss the 32-count indictment against former Trump campaign chairman Paul Manafort, which includes bank fraud and tax evasion, among charges, was a proceeding that was part comedy and part boxing match. Judge Ellis hit prosecutor Michael Dreeben right out of the gate, at times mocking and laughing at assertions made by the attorney, known by many as something of a criminal law savant. Interrupting Dreeben repeatedly, the judge then offered his own view of why federal investigators went after Manafort, saying it was part of “a time-honored practice” of prosecutors,” adding, “You get somebody in a conspiracy and then you tighten the screws.” The judge added, “Ive been here a while, the vernacular is ‘to sing,” referring to prosecutors persuading a defendant to talk. The judge appeared inclined toward the defense argument that the Special counsel appointment order was overly broad, the judge added, “I’m not saying there’s anything wrong with that,” referring to a prosecutor using charges as leverage over a defendant to get more information or wrap up other potential targets. Dreeben appeared caught off guard, as the judge repeatedly peppered the attorney about the prosecution's motives. “We are the Justice Department. We are not separate from the Justice Department,” Dreeben asserted, trying to regain his footing. 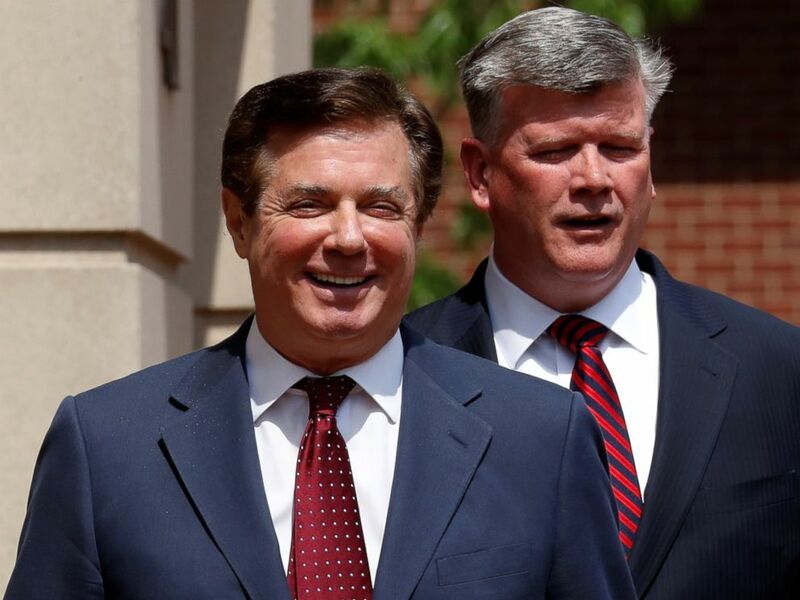 President Trump's former campaign manager Paul Manafort smiles as he and his attorney Kevin Downing depart U.S. District Court after a motions hearing in Alexandria, Va., May 4, 2018. The judge then asked the government to give him an unredacted copy of the memo. Dreeben said he would have to run that request by the “national security community” so as to safeguard sensitive matters in the document that relate to the ongoing investigation. The judge asked why Mueller couldn’t just hand the case against Manafort back to Virginia prosecutors, and Dreeben tried to explain that the Special Counsel’s Manafort indictment arose from it’s original authority to investigate the Trump campaign and any links to Russia. Manafort lead defense attorney Kevin Downing spent little time arguing his motion to dismiss. The judge said he would take all arguments “under advisement” and would rule another day. A trial for Manafort is set for July 10. During his address to the National Rifle Association in Dallas later on Friday, Trump praised the judge as “really something very special...he's a respected person."